Versatile key-position player who can play at either end of the ground and in the ruck. Finished fourth at the Crows for clearances, sixth in contested marks and equal-seventh for hard-ball gets despite missing two games. 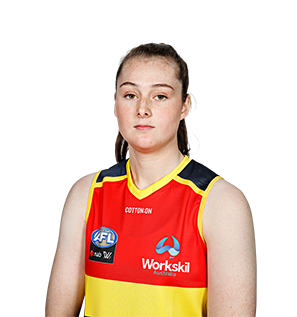 Draft history: 2016 NAB AFLW Draft 16th round selection (Adelaide) No. 122 overall. Debuted in Adelaide’s historic inaugural win against Greater Western Sydney but had to wait for the trip to Fremantle Oval against the Dockers in Round Four to return to the team. Didn’t miss a game thereafter, adding flexibility and grunt to the side. She finished fourth at the Crows for clearances (nine), sixth in contested marks and equal-seventh for hard-ball gets (16) despite missing two matches. Proved she has a bright future ahead.